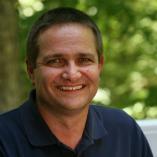 Feng Shui is a though system governing spatial arrangement. According to this school of thought, the placement of spaces, walkways and items within the space have a significant effect on how peaceful and enjoyable it is. We had the good fortune of working with these Warner Robins GA homeowners years before in building an Ipe deck on the front of their home. They lived in an area where, like old times, people convened in their front yards to socialize and be part of the community within their street. Knowing the value of a well-placed and high quality space, they knew we would be the perfect people to call when they wanted to build a deck to go with their koi pond in the back of their home. From the backyard, the family had a set of stairs that ascended to a small landing at the second floor level. This stair set provided access from the main living level to the backyard. The problem was that they never used the stairs. Instead, they used the stair set within the home down to their much used lower level living area. The exterior stair set ended up being an eyesore from both the outside and the inside since the landing deck railing was viewable from the inside. We suggested removing the stair set and exchanging that door for a window. This removed the eyesore from both the inside and outside and created a much more favorable space upstairs which was now no longer obstructed by the railing. 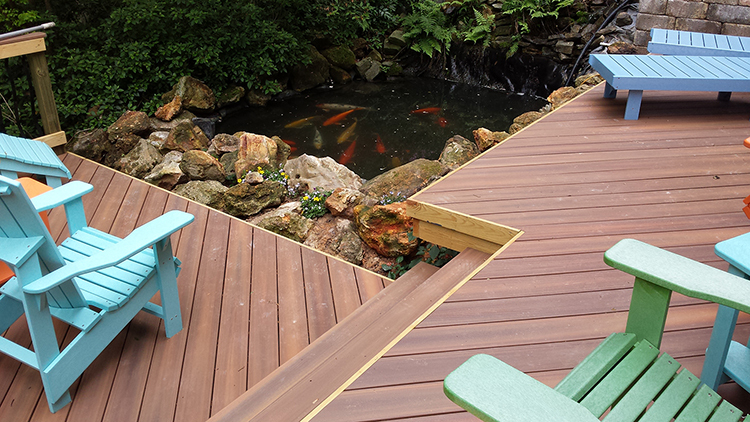 Next came the fun task of designing a deck on the lower level where they could enjoy their koi pond. Feng Shui played a huge part here too. The deck has a couple levels, each visually distinct by the direction change in the decking. The levels flow seamlessly from one to the other. 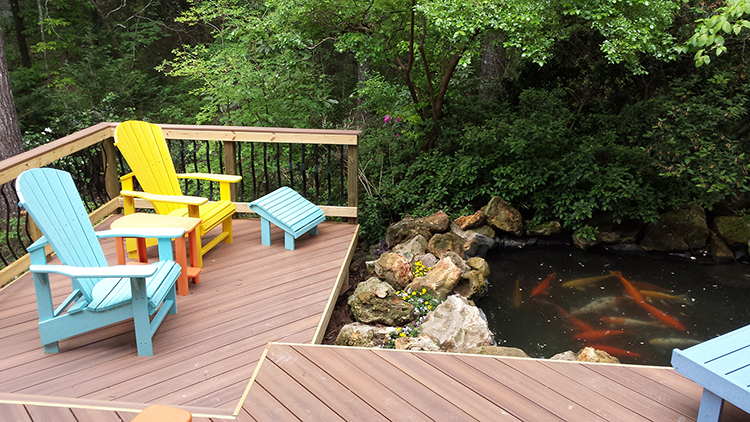 The koi pond is surrounded with a deck space on 2 sides allowing the maximum viewing space of the pond. Brightly colored furniture furthers the light-hearted and relaxing feel of the space. It beckons you to pull up a chair and stay a while. The family wanted to maintain some consistency and continuity with the Ipe Brazilian hardwood deck on the front of their home but they wanted low maintenance for this deck. Fiberon composite decking comes in an Ipe color that does a good job of complimenting the look of genuine ipe. The color is warm and rich and the boards have streaking to match the exotic unique coloring of the exotic hardwood. The added benefit is that, unlike the deck on the front, this deck will not need to be stained and/or sealed. It will continue to look this good year after year. The 25-year manufacturer’s warranty guarantees that fact. Also to compliment the front deck, this one has Fortress Iron Baroque railing pickets. They not only compliment the other deck but they also maximize visibility to the yard with their dark color and slender profile.